Pattern mixing used to be such a scary thing (I remember being totally freaked to try this combo back in 2013!) but now I don't even realize I'm doing it. A little buffalo plaid with stripes? No problem. I probably should have tossed in some leopard to really make it fun. I got this scarf for Christmas and I love how easy it is to wear. It's just one small loop that goes right over your head so you don't have to worry about twisting it around or getting it to fall right. Scarves for beginners. 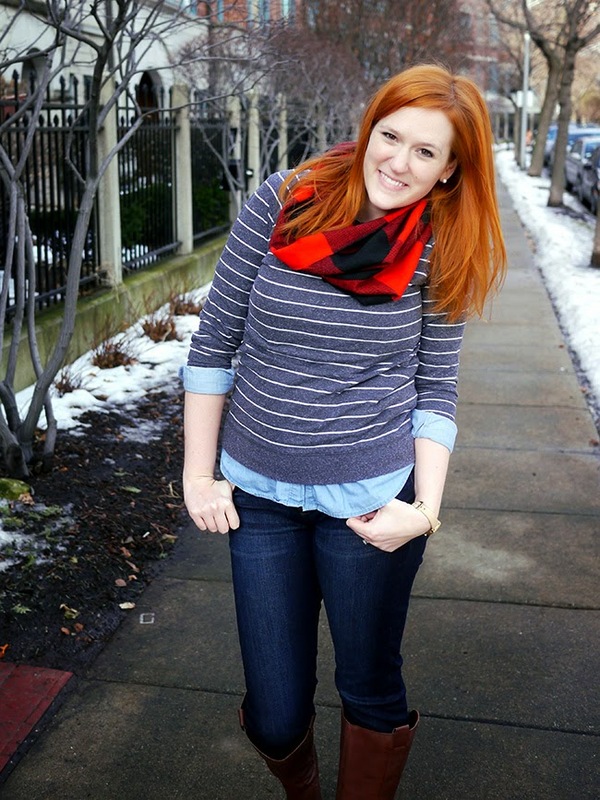 Oh, and yes, you're right, I am wearing those Madewell jeans again. I was this close to taking them back, and then my go-to pair started to disintegrate. I decided I was just being a bit hypercritical of them, the knees really aren't any bigger than any other pair I own. And in case you're wondering, I did break my "no more boots" ban and grabbed another pair during Sole Society's after Christmas sale. They were final sale, which was a bit of a mistake because they hit my ankle bone a little funny. With extra thick socks it isn't that noticeable, but I'm hoping they break in a little better. In other clothes related news, I have to get my headshot taken at work today, which was weirdly stressful to plan an outfit for. It feels like getting ready for school photos all over again. I'm writing this post in advance, so fingers crossed I didn't freak out and pick out something totally crazy this morning! 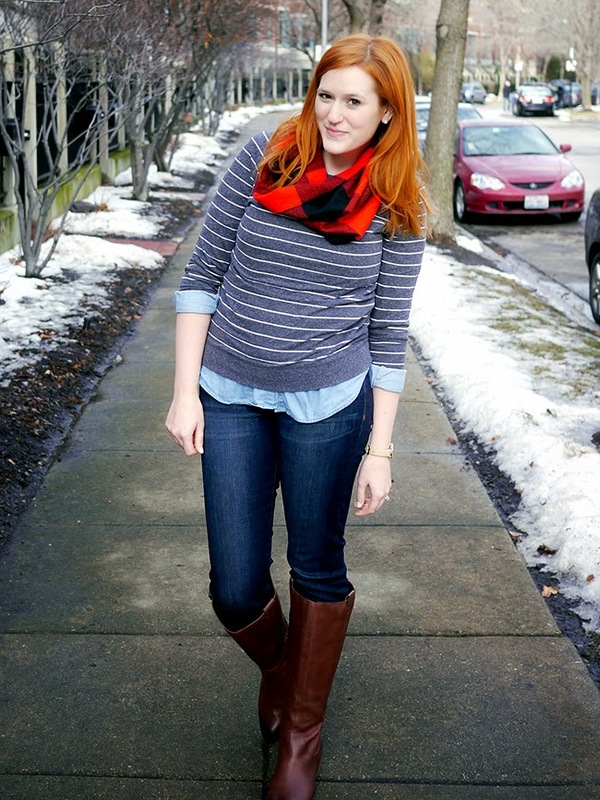 Linking up with Friday Fab Favorites, Random Wednesday, #stylemeweekly and Style Me Wednesday. Well hello adorableness. Random note: Last night I had to come to your blog to look for a post and then I had a dream I had your color of hair. It was the best because I have always wanted your color and then I woke up and had plain old brown. Isn't pattern mixing the best!? Totally glad it became a trend and it does come a lot easier to me now that I have been doing it a while! This is such a great combo on you and I LOVE those boots! What a great casual look. Haha - I am the same way with pattern mixing!! Half the time I don't even realize I'm doing it! You can never go wrong with checks and stripes! Love the pattern mixing!! That scarf is amazing! I do still have to get school pictures taken every year, and it's stressful, I feel ya! 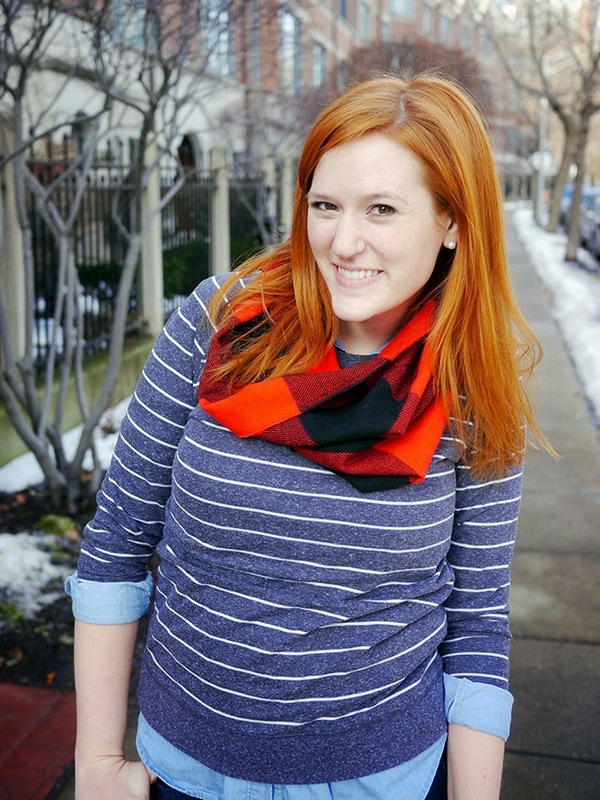 Love the striped top with the plaid scarf! 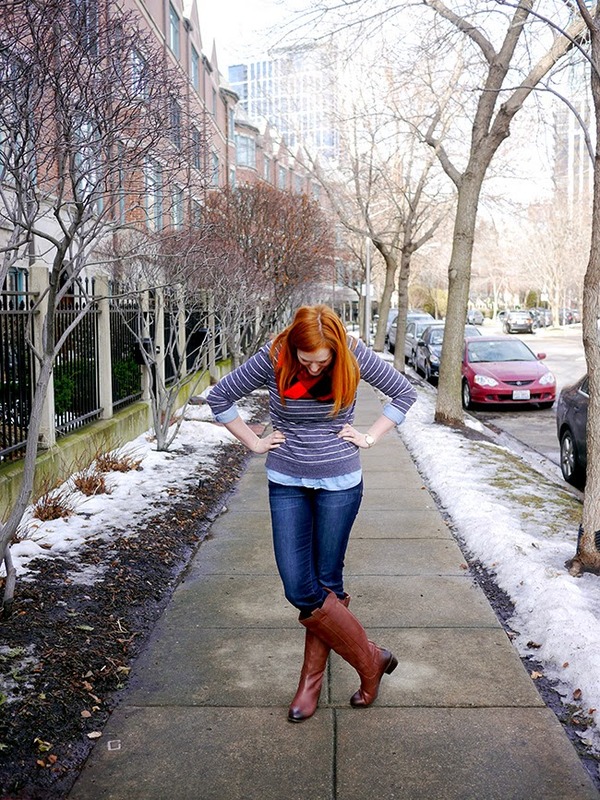 Loving everything here- you're a print-mixing pro, and those boots are gorgeous. love this look! cute scarf!